There are different types of congestion that you can suffer from, the most common type being nasal congestion. It is also known as nasal blockage, nasal obstruction, blocked nose, stuffy nose, or plugged nose. Nasal congestion occurs when there is swelling of the tissues and blood vessels in the nasal passage. This results in a congested or stuffy feeling, it can also cause mild facial and head pain. Nasal congestion can have a variety of causes, including colds, flu, allergies, sinus infections, nasal polyps and environmental irritants. Over the counter nasal sprays can provide quick relief from a stuffy nose, but did you know they can be addicting? The good news is that there are several simple home remedies for congestion can also offer natural relief. Sinuses become inflamed when the air you’re breathing is too dry, which leads to that uncomfortable stuffy feeling, so many people turn to humidifiers or vaporizers to relieve nasal congestion. If you don’t have one, boil a pot of water on the stove and carefully breathe in the steam. You can also add a few drops of peppermint essential oil to boiling water for an extra kick. Breathing in moist air can help soothe irritated tissue and swollen blood vessels in your nose and sinuses. Note: Steam inhalation is generally not recommended for young children because of the risk of scalding. When you have nasal congestion, often the best relief is taking a hot shower. Like the humidifier, the steam from a shower helps to thin out the mucus in your nose and sinuses and reduce inflammation. It’s a good idea to go straight to bed after the hot shower. Another option is to wet a washcloth in warm water and place it over your face. Leave it on for 10 to 15 minutes. As a result, your breathing should return to normal. Neti pots, which you can find at many drug stores. It is designed to push water through your nasal passages. This is a gentle and effective way to clear the nasal passages of mucus and allergens. The Food and Drug Administration recommends distilled or sterile water instead of tap water. To use a neti pot, mix one teaspoon of salt in two cups of distilled warm water. Fill a neti pot with this water. Tilt your head to the side over the sink, and pour water into one nostril – it will come out the other nostril, washing away mucous and irritants. Do this for a minute or more, then switch sides. Repeat once or twice daily for a few days. Ginger has many medicinal properties which help to cure a wide range of diseases and disorders. Ginger is a natural anti-viral and anti-histamine that can destroy all types of microbes and help reduce the inflammation in the mucous membranes, which makes it suitable for treating a cold or nasal congestion. As an anti-inflammatory, ginger may also reduce swollen sinus membranes to assist in clearing sinus passages and reducing sinus pressure. Ginger can blend well with salads, soups and pastas. You can also make ginger tea: Grind the ginger and squeeze the juice out of it into a small cup. Mix 4 tablespoons of honey into the juice. Take half a teaspoon of this mixture twice per day. Garlic is on of the best home remedies for reducing nasal congestion. Garlic contains high levels of anti-fungal and anti-viral properties, which are used in the treatment of viral infections like cold, influenza causes stuffy nose. Eating fresh garlic cloves can help relieve stuffiness and discomfort. If you do not like the taste of raw garlic, try heating them until steaming, then carefully inhale the garlic steam. Your stuffy nose should be history after that! A few herbs, especially menthol and eucalyptus oil, can also help ease nasal congestion, thanks to its decongestant and anti-inflammatory properties. In addition, studies have shown that eucalyptus oil can help loosen phlegm. Adding a few drops of the oil to hot water and inhaling the steam for about 10 minutes. Black pepper is also one of the best home remedy for treating nasal congestion. In Western herbalism, it is used in antiseptic cold and flu preventatives like fire cider. Inhaling black pepper, or the smoke released by burning five or six black pepper seeds, it might make you sneeze, do not suppress it. 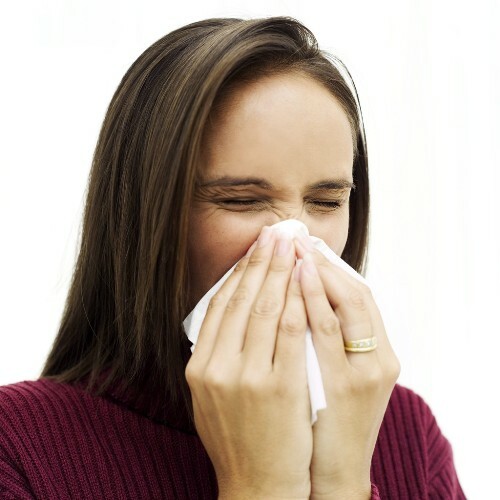 Even if you don’t sneeze, the thin mucus will drain off to relieve you of stuffy nose. Note: If you do not get relief from nasal congestion after following any of these home remedies, contact your physician. If you experience other symptoms such as a high fever, one-sided nose bleeds, wheezing or shortness of breath, or persistent facial or tooth pain, see a doctor right away.